Once upon a time, a 15-year-old boy made friends with a cool blonde girl who worked down the local chippie. They moved into a flat together and everything was great, until an annoying Mancunian boy arrived and kipped on their sofa. But they all ended up the best of chums – along with the skinny girlfriend of a photographer and the daughter of someone famous. They were like the cool kids at school everyone wanted to be friends with. So is it any wonder that Debenhams wanted Henry Holland to be part of its designer gang? In Glasgow to launch the new H! collection for the high-street giant, he insists that he’s only too aware of what it must all look like from the outside. “When I met Aggy [that’s supermodel Agyness Deyn, people, keep up], I was 12 years old and she worked in a chip shop,” he says. “I didn’t look at her and think, ‘In 15 years’ time she’s going to be a top model, I should make friends with her now.’ I made friends with her because I got a discount at the chip shop. “I met Pixie [Geldof – come on!] when she was 15 years old and I worked at Smash Hits magazine. “I’m very lucky to have amazing, inspirational women around me,” he adds, “whether that be people I’m photographed with in the paper, who are immensely stylish and famous for being so, but also my mum, my auntie … my grandmother wore matching trouser suit and blouse until the day she died, and she was amazing. She wouldn’t answer the phone without her lipstick and her earrings on. Born in Lancashire, Holland graduated from London College of Printing with a BA in journalism, and worked as fashion editor on teen magazines. He admits now that his career in fashion proper started as a bit of a joke, when he created slogan T-shirts for his mates (example: ‘I’ll Tell You Who’s Boss Kate Moss’ and ‘Get Yer Freak On Giles Deacon’). In 2006 he presented his first bona fide collection in London, and who else would he ask to model it but long-time BFF, Deyn. “We lived together for five years and we are really close – we’re family in a way,” he says. “We’ve been inseparable, we’ve gone everywhere together and I’m very lucky that her career trajectory happened at the same time as mine. She’s one of the world’s biggest supermodels – you wouldn’t go somewhere else would you? House of Holland is now a regular on the London Fashion Week schedule – when we speak he’s preparing his 12th runway show – and is celebrated for its hip, London-girl look. Holland’s own wardrobe reflects that sense of street style – leather jacket, jeans and chunky skull ring combine with gleaming neon trainers and that trademark cockatiel quiff; part punk, part poodle. His collaborations are legendary – those suspender and alphabet tights for Pretty Polly are now a style staple. He has also worked with Superga, Levi, BlackBerry, Charlotte Olympia, Roxy, Asos and Swarovski. Some people might say, then, that the deal with Debenhams, signed off in 2010, was one collaboration too many. People like Miuccia Prada, who famously said she would never collaborate on a diffusion line, sneering that most are merely a “bad copy of what one does for the main brand”. “Those people are few and far between now,” says Holland. “Karl Lagerfeld has done it – he was the king of elitism. Donatella Versace, Marni, Comme des Garçons. I really like it and, as a designer, I like to translate my aesthetic in lots of different ways – whether that be iPhone covers or a diffusion line or whatever … And I really like seeing a different customer. “I think more and more being a fan of fashion is as big a thing as being a fan of football. How many young girls and young boys write fashion blogs? It’s what they talk about and what they write about. Their whole thing is saving their money to buy certain things so they can show off at the weekends. It has always been like that but with the internet it has grown and they’ve become a legitimate market. Let’s watch his latest fashion show AW 2013 in London to know him more! FIRST LOOK: Red and pink seventies print suit. HAIR: Tousled, slightly dishevelled and parted. LIPSTICK, POWDER &PAINT: Metallic and jewelled on the inside of the eye. FINALE LOOK: Purple to floor gown with applique pills and cocktails, complete with 90s-esque purple shearling. WE LOVE: The 80s cocktail applique prints (and matching earrings!) and the 90s Oasis shearling parkers. WOULD YOU: Be brave and wear a waxed leopard print cap? IT’S A FACT: Henry’s Catwalk Carpet matched his backdrop curtains. While the Elizabeth and James girl is typically somewhere in her twenties, Ashley and Mary-Kate Olsen have always approached her as someone wise and sophisticated beyond her years (much like the designers themselves, or their sister Elizabeth, who made the rounds at the Fall presentation). The new collection was ripe with covetable, grown-up outerwear, including rounded-shoulder coats cut from cozy faux shearling fleece or watermelon-colored mohair. Maybe the discerning E+J customer originally had her heart set on something similar from The Row or Céline, but scoring one of these utterly cool toppers at E+J's more attainable, contemporary price point is by no means a concession. It's more like a win. Other winning items here included a black bomber jacket featuring slick patent sleeves, and a pair of menswear-y, relaxed plaid trousers. This season, Elizabeth and James debuted its much-anticipated line of handbags, which included navy or leopard-print hair-cow slings as well as functional leather shoppers that will undoubtedly build up a following of their own. At the risk of speculation, we'd argue that when most think of Italian fashion it is with storied high-end brands with high price points to match in mind. Getting a dose of Milanese style barely registered in the contemporary market in the way that a girl can get a hit of Paris fashion from Maje or Sandro. One savvy Italian saw a hole in the market and filled it with MSGM. Launched by former DJ Massimo Giorgetti in 2009, the brand specialized in brights, digital patterns and innovative, interesting shapes. It's young, fun, modern and therefore beloved by the fashion blogging set. Read on for insights from the effervescent Giorgetti on his love of music, color and Alexa Chung. Harper's Bazaar: Your brand has grown quite quickly. Why do you think consumers and editors drawn to MSGM, what space do you think it filled in the market? 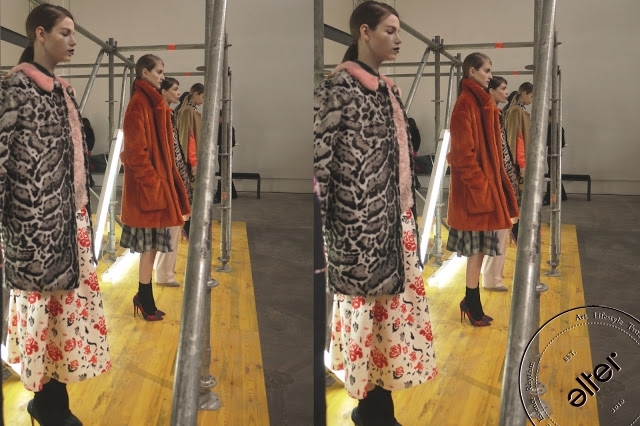 Massimo Giorgetti: MSGM has grown this quickly because I think it anticipated trends and offered something new. Presenting a collection in 2009 with psychedelic prints done by computer and in fluorescent colors was the secret to MSGM's immediate success. Also, right from the beginning we wanted to create a contemporary collection — which wasn't something very common in Italy at the time — and get the message out immediately, considering the impact that social networks were having. I think the market was waiting for a product like ours; many young people were already getting ideas more from the Internet than from the pages of magazines. MSGM is really created for a young public that adores fashion but isn't a slave to designer labels, a public that likes to dare and likes to be noticed. HB: Tell me about your love of music, what bands inspire you? Who is on your iPod now? MG: Up to 5 years ago I was a DJ, it was more of a hobby than a job but music is everything to me! I can't wake up in the morning without loud music at home. It gives me energy, positivity and it makes my fears and worries disappear. Music gives me courage. In the first collection for Spring/Summer 2010 there was the 'Electrocardiogram Acid Multicolor' print which was created while listening to 'In this Home on Ice’'by Clap Your Hands Say Yeah. Then there was MGMT, The Strokes (I’m mad about Julian Casablancas) and the Arctic Monkeys (I adore Alex Turner). Now I listen to the Fun a lot and the Of Monster and Men. HB: Who do you think of as the MSGM girl? MG: The MSGM girl is young and loves fashion with a capital F. She's very fashionable without being a fashion victim. She's extremely informed and in touch with everything. She's a girl that is both courageous and irreverent — a bit like the MSGM collection itself. HB: What initially made you want to launch your own brand? MG: It took two trusted friends and a loved one, all three of them very close to me, to convince me I was ready to take on this adventure. We were initially all four going to be associates. Then we were down to two. And immediately afterwards I was on my own. HB: What does MSGM mean? MG: MSGM are the initials of these three people and myself. It also corresponds to a kind of play on my name and surname. Moreover when the MSGM name was being thought up, I was always listening to the 'Oracular Spectacular' album by MGMT. My brand couldn't have been called anything else. HB: How important do you think street style representation is to a brand right now? MG: I think it's fundamental. Already it's become the norm to look at photos of outfits worn by young people on the street, bloggers, journalists and buyers at the shows. Viewers naturally want to be able to dress in the same way. HB: Are there any celebrities on your radar that you would love to see in your clothes? MG: There is one in particular that I adore… Alexa Chung. Also I'm very interested in dressing stylists, fashion editors and bloggers. I consider myself very lucky though because many of them are already fans of MSGM. HB: What do you do when you're not working? MG: I go to the gym, I swim and I jog. Then I watch loads of TV series in streaming, I go to the cinema a lot and read (unfortunately not enough…). I like cooking as well and organizing dinners with friends. MG: On the sea, with a sailing boat or a catamaran. This summer I spent two weeks in and around the Eolie Islands on a catamaran. The islands are unforgettable. HB: Do you think of MSGM as an innately Italian brand? Why or why not? MG: Yes, MSGM is an emerging Italian brand. Italian because it's based in Milan and because it's completely Made in Italy. But at the same time I like to think of it as being an international brand because it's already selling in 300 stores worldwide! Golnaz Ashtiani’s achieved her ticket to success in 2011 when she won the TFI Best New Labels competition. The designer, who studied at the London College of Fashion, launched the ASHTIANI fashion line and has presented five seasons in a row at the World MasterCard Fashion Week in Toronto. The label’s Fall/Winter collection combines deep fall colors with neutrals and pops of bright color and printed fabrics. The line experiments heavily with textures, mixing materials like mohair, leather, and sheer panels. Ashtiani gives classic style and tailoring a modern twist with geometric and unconventional shapes in the patterns and construction of the pieces. Ashtiani as one of the best selling ALTER brands, shares with Real Style her fall fashion advice and her favorite trends. Real Style: What are your three fall essential must-haves for women this spring and why? Golnaz Ashtiani: The show piece Cape Coat: If there is one thing you need this Fall is a stylish Cape that immediately transforms your style. You throw it over anything match it with a long leather boots and you have got the look. Flared hem skirts and dresses: feminine, fun and easy to wear. They are great for the holiday season. Key pieces with multi fabric combinations and textures are definitely top of the list this fall. I’m really in love with the color palettes as well; rich tones like aubergine, mustard, and navy are very striking and can make some fabulous dramatic impact in your wardrobe. RS: What are your favourite trends this season? GA: I love the mixing of unexpected fabrics that I’ve seen utilized in the fashion world lately. It’s a really creative way of exploring and pushing the boundaries of the way we are used to using textiles, giving depth and dimension to the cleaner lines we’re seeing right now. RS: What are your favourite fall accessories? GA: Colourful fur clutches are at the top of my list for fall accessories for Fall/Winter 2013. In fact, I’m seeing fur being used in a range of accessories this season; it’s luxurious and adds so much texture. Accessories are an easy way to update and add versatility to your wardrobe if you’re not looking to dive head first into a trend, especially if it’s something as pricey as fur. RS: What is your top trick for making a woman look slimmer? GA: Wearing structured one piece dresses is a flattering way to achieve a slimmer silhouette. I think it’s also about knowing your body shape helps in finding a right outfit that would suit you. RS: If women could only buy one piece from your collection this fall, what would it be and why? GA: That’s a difficult question! But I guess I’d have to go with the long-sleeved knit dress from our Fall collection. It’s got a great flared hem, and mixes the knit with hand-made silk and faux Persian lamb velvet inserts. The silhouette skims the body and the lines are very flattering. Plus, the fabrics and are just so fun and luxurious! RS: Layering is always a huge trend for fall. What are your do’s and don’ts for layering? GA: I feel like layering can go wrong when people try to layer all in one color or in mass. Heavy layering isn’t really in trend anymore, it should be used as more of a way to ‘peek-a-boo’ mixing sheer light weight fabrics with heavy one, this would create a balance in layering. I find that many people tend to over accessorize things, or swath themselves in draped fabrics that can look dowdy. Using tailored, clean lines while layering can give a more flattering effect that is more on-trend with the minimalism we’re seeing now. RS: What is on your holiday wish list? GA: Getting a new hand-made mannequin for the studio. VIVETTA was founded in 2008 by Vivi Ponti, its designer. Launched its first collection at the fresh lounge “who’s next” competition as the prestigious winner, it has rapidly emerge as one of the most sought after brands by young designers in Italy. VIVETTA designs are purely made in Italy both in material and production and now are stored in more than 24 multi-brands boutiques all over the world. Also known as Vivì, Vivetta Ponti is the brilliant young designer behind the fresh new fashion brand Vivetta worn by celebrities such as Alexa Chung and Peaches Geldof. Living and working between Milan and her hometown of Assisi in the hills of Umbria, Vivetta launched her eponymous Made in Italy line after winning the Parisian Fresh Lounge prize. Your fashion is very playful, colourful, cute and fun. How much of your own personality is in your work? Everything I like is reflected in my work but sometimes I discover I design something that I really like but I didn´t think to design or wear. You are also very influenced by the Swinging Sixties -what is the fascination for you of that time? In an interview you once said that you find your inspiration in anything. “It can be from working or reading a book or watching a film or drinking a glass of red wine.” What are you reading at the moment and what was a great movie you have seen lately? You have worked for Roberto Cavalli for some time as assistant designer. What was the hardest part there and what the best part? And what have you gained from your time there? I learned lot of things – all I know about doing a collection. I had a great time there, it was team work and we were all very close, it was like a big family. The best part was working on the catwalk collection. It was the most creative part and we did lots of handmade things ,very big embroideries and special items. We could do everything. The hardest part was the days before the show where we worked everyday till night, sleeping very few hours each night and working 7 days on 7. To decide to do your own label – the best decision you ever took in your life? From when I started working I´ve always known I would be having my own label, so yes, it´s the best decision of my life to have started it. I deeply love Vivetta and I´m working hard on it to let it grow. What is the best piece of advice you can give you young designers? I heard Milan can be a very rough place to live in – workwise and also in general – is that true? I’m super happy when I have good news from Vivetta or something good happens for the collection! I am also happy when I have time to relax and do what I like. If i have only a day off to work I love to stay home in bed with all my cats and whatch movies all day long. If I have more than a day I like to go out and do research on thrift, book stores etc. Today for a cat I miss, I saw his pics and I printed one to put on a frame and later on the wall. The most beautiful thing in life is?